Pattern Description: This pattern has diagonal panels with a zig zag design within. A zipper runs diagonally across the panels that make up the shapes. The decanter has a long thin neck and a conical top on the stopper. The tray is scalloped on each panel. The manufacturer of this pattern is unknown but is probably from Argentina. 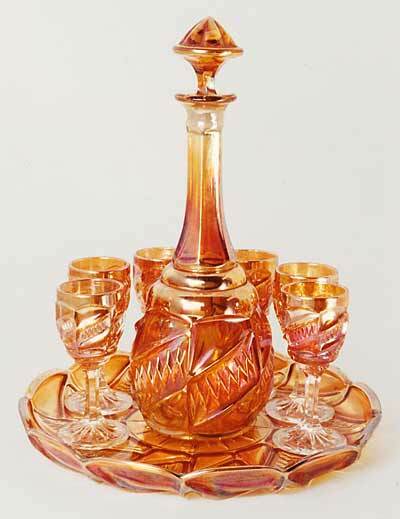 The complete cordial set consists of an approximately 9″ undertray that is rolled up on the edge, 6 cordials that measure approximately 3 3/4″ and a decanter (with stopper) measuring about approximately 10″ tall. The decanter and cordials have 6 panels while the undertray has 12 panels. The year of manufacture is unknown. Because pieces were broken or sets were separated, you will often see this pattern sold as the components. Marigold is the only reported color.